Our PBS program is off to a great start. Students earn Coaler Cash for exhibiting behaviors of the S.T.A.R. matrix (being safe, taking responsibility, achieving excellence and respecting others). 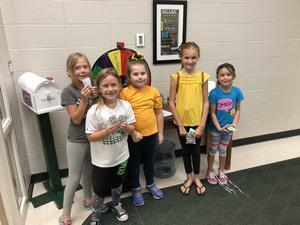 One reward that students can purchase with their Coaler Cash is a spin on the PBS wheel in the main office. Students have the opportunity to win numerous prizes that include, the Principal's chair for the day, the Secretary's chair for the day, pizza party in the loft, extra recess and school store coupons.